hailing from both sides of the Atlantic. New York raised Niall is on guitar/vocals, with the UK contingent, energetic brash beat connoisseur Dave on drums and punk/funk bassist Justin ensuring slowline's influences are spread out across borders and the years. With the current line-up forming in September 2005 the band has recently appeared on the London scene with shows at venues such as the Bull and Gate, Hope and Anchor and a recent headline spot at the Dublin Castle. Releasing a four song demo EP at the end of last year to showcase just a small part of their work, the band manage to follow their own path with music that combines melodic precision whilst cruising towards climatic chaos. 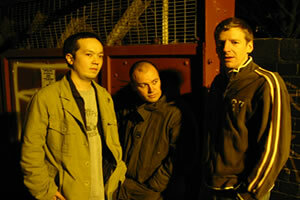 slowline ensnare the economy of drums, bass and guitar whilst ensuring nobody has any place to hide. The band have done another batch of songs in March which compiled their second demo EP and they also have more London shows on the horizon. "a successful amalgam of the haunting and the crunchy"
"the tender discordance of Pavement fused with driving melodies""
"styles twist and turn, as much a textural event as a show"
"Check them out while the tickets are easy to get." Give the sound clips a listen - and let us know what you think. Read reviews on slowline - and find out what the others think. Character 1: So what do you guys sound like? Character 2: Can you translate that? 1: You know, what are your influences? 2: Oh, you mean you want us to run off a list of bands we like. 1: Yeah, I guess so. 2: Ok, then well I guess our overall "sound" is a mix of favourites from all of slowline - and as opinion changes quite often, we sound like something different each time you ask, listen or even think about it. 1: Thats nice, but can you answer my question? 2: Right, What was the question again? 1: What are the bands that you look to for inspiration? 2: Thats a pretty dumb question, why would we "look" for inspiration, I'd hope we have it in the first place.